The first was so wretched I wasn’t sure I could face another – time consuming and the end result so crooked and weird – and I had used some of my favorite Joel Dewberry. Sigh. 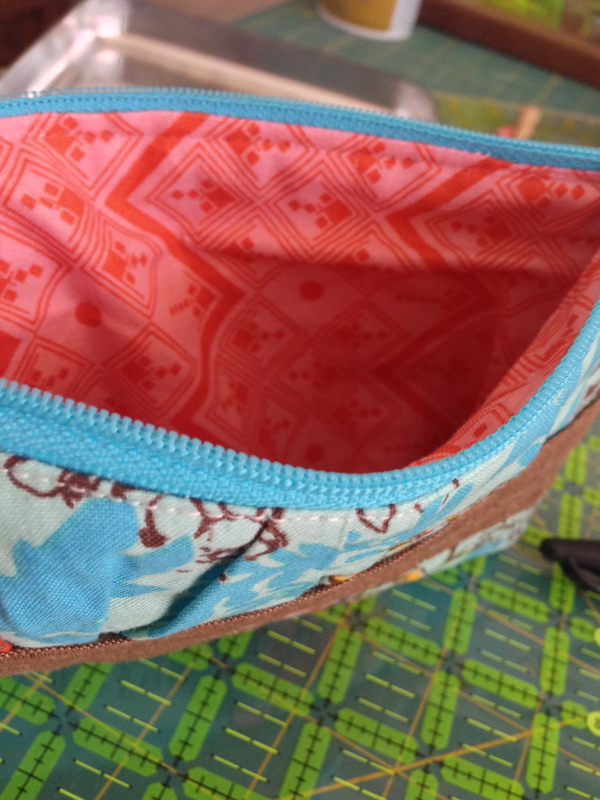 But the next one turned out better, and by the time I got around to making my swap pouch, I was making quite passable pouches. But they took forever, and I was fairly certain pouches weren’t for me. And then I wanted to make some for gifts, so I faced the zipper foot and the fusible fleece again. 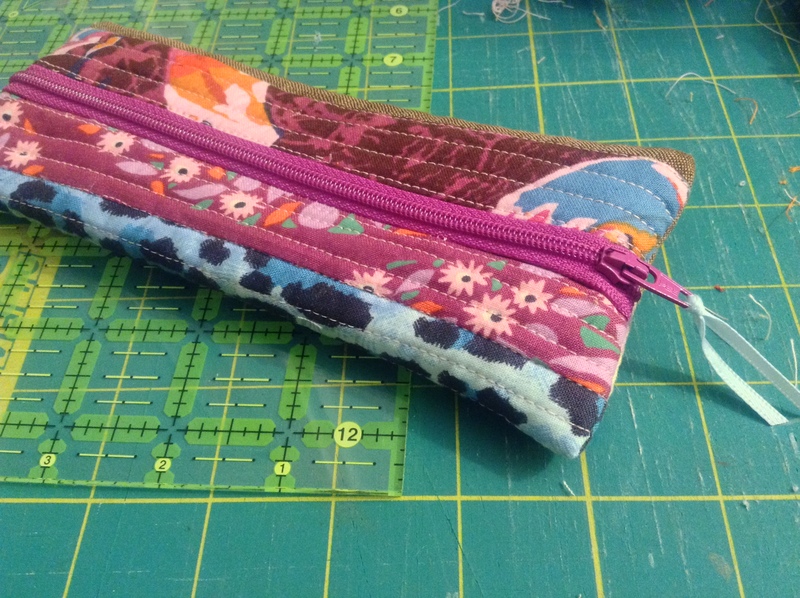 little Anna Maria Horner pencil pouch for my friend T, of my own design. 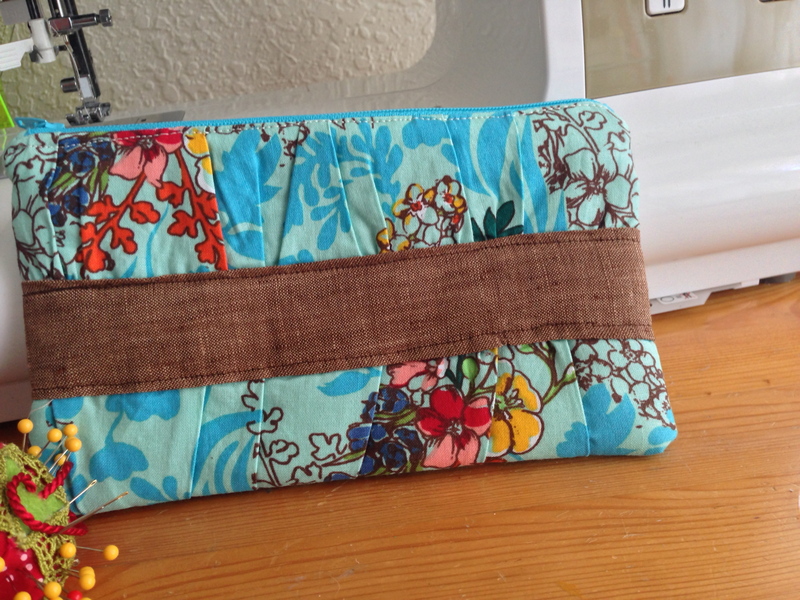 And an absolutely charming gathered clutch (from the noodlehead tutorial) for my aunt. Love everything about this one…linen, AMH fabric and lining, so sweet and pretty. By the time I was finished with these, I could face the sew together bag by sewdemented that I had been to scared of (with more than a little help from this tutorial). 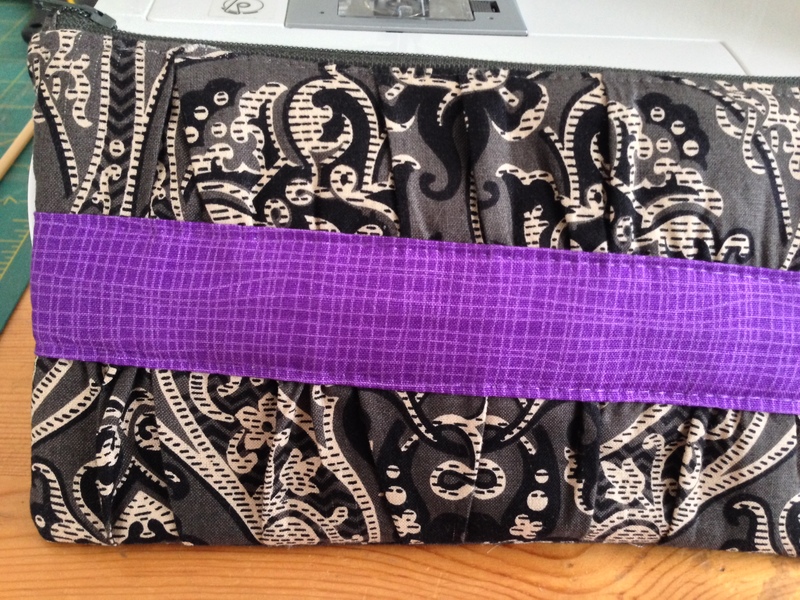 It is not perfect, but I am very impressed with myself – I am so far ahead from when I took up sewing again 6 months ago. And now I am a little bag expert. I zipped up this little darling this afternoon (also for myself). 1. 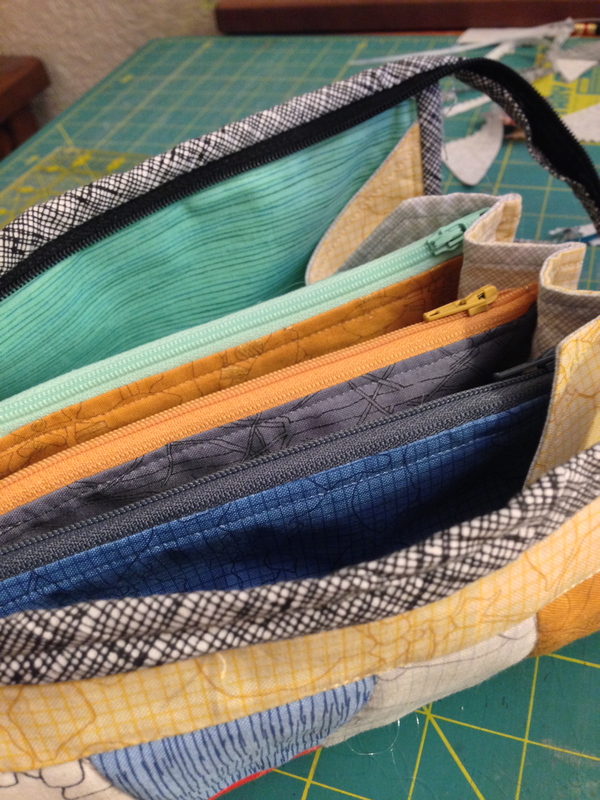 Make my lining 1/2 inch shorter than what pattern calls for so they aren’t all crumply inside. (not an issue with the sewtogether bag). 2. Skip the zipper foot, just use my walking foot. 3. Until I am good at top stitching (in 2040), I am just going to use invisible thread. 4. It is pretty cool to know what fusible fleece is for. Grey Squares Bed Quilt: Finished! 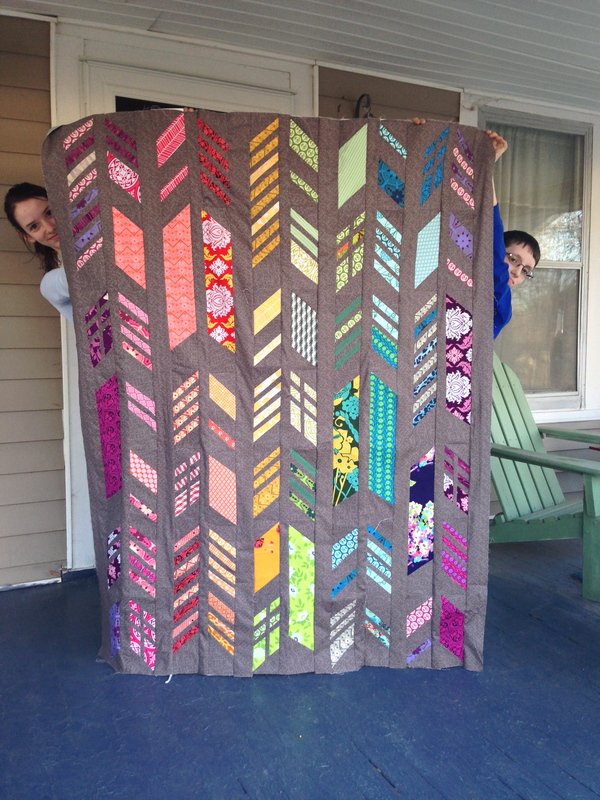 I finished the top for this quilt in early December, and dropped it off at the quilters and got it back in early March. Booo. 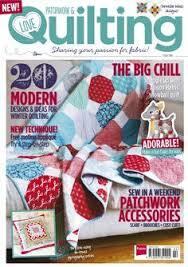 But I couldn’t face quilting something this large on my little machine. 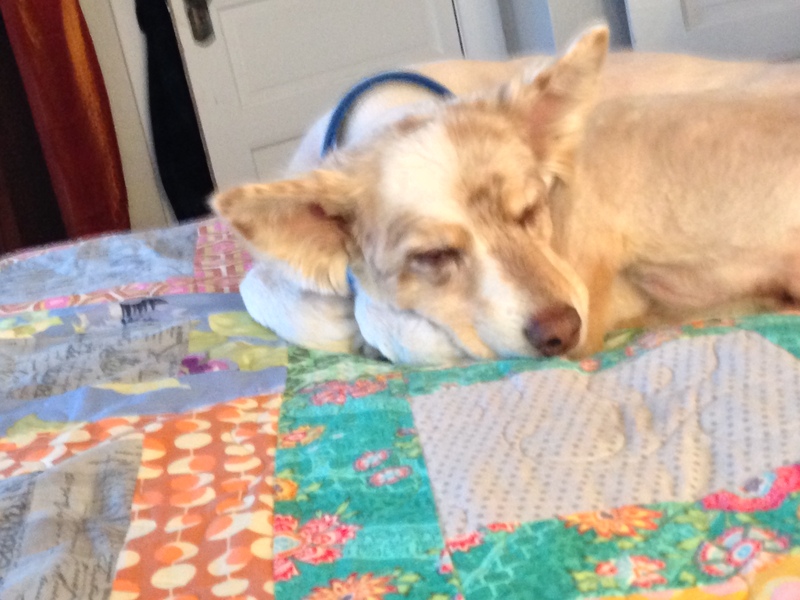 But I can’t face waiting that long for a quilt to get back to me again. Conundrum. 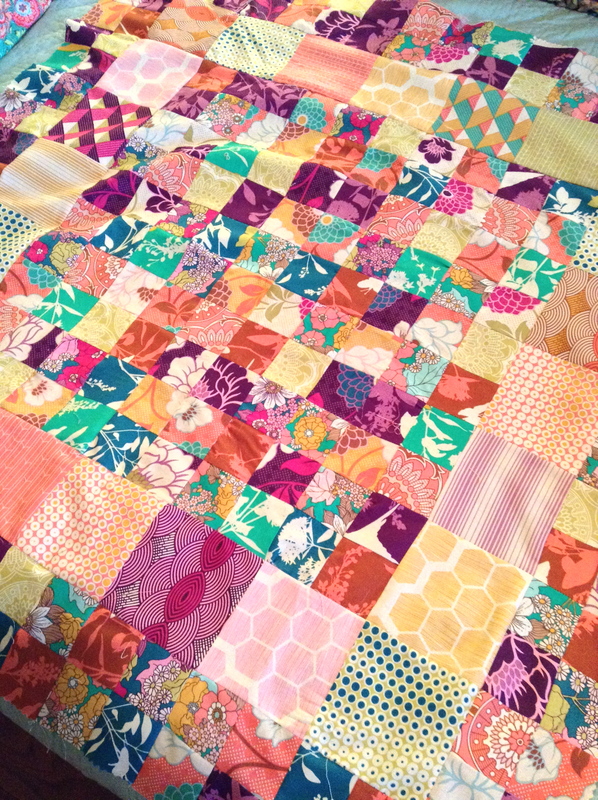 Anyway, the quilt is 8″ grey squares surrounded by 3″ borders of the most gorgeous Amy Butler “Spots” fabric, with some Anna Maria Horner and Amy Butler floral prints thrown in for good measure. The grey squares are too match my grown up grey curtains. And now my bedroom / sewing room be done being decorated. Woot. I’ll take some pictures as soon as I can clean things up a bit. And you will see lots and lots of pictures of the quilt on this blog as it will be the background for lots of my sewing projects. 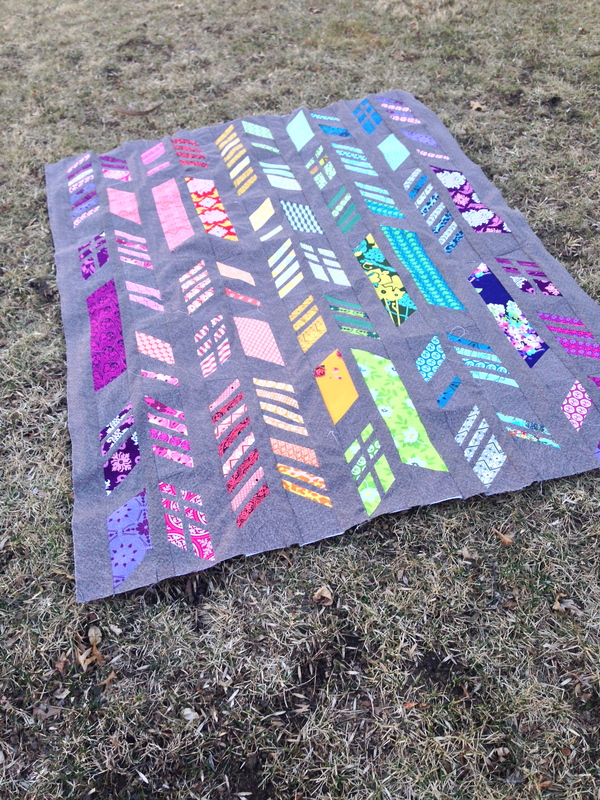 I love it, but am afraid to quilt it – not as big as my bed quilt, but not small either. So I have a day off today also – going to work on teeny tiny blocks like the one above and avoid, delay, etc. A mixture of weather (good) and gastrointestinal distress (bad) meant less than the normal amount of sewing. Still a lot, but not a, let’s say, “crazy” amount. 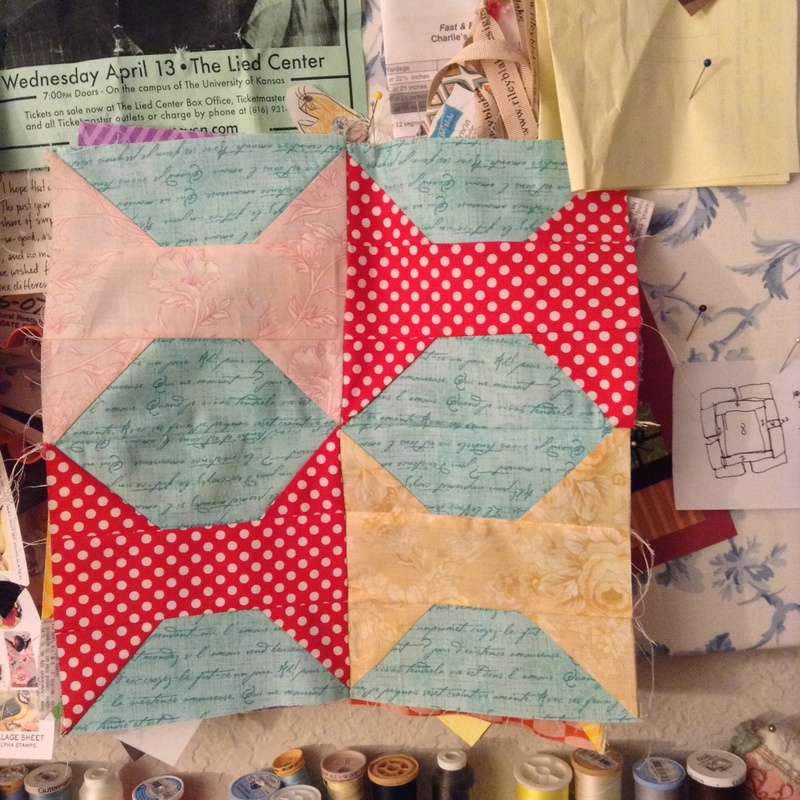 I did find time Saturday to work on my feathers blocks for the Feathers QAL – I still am a week behind. I am not fast at these, but they are fun. And the accuracy of the blocks is ta die for. In addition to creating all the prettiness, I love how supportive and kind and generous people are with their encouraging comments when I post something to Instagram. Truly awesome. 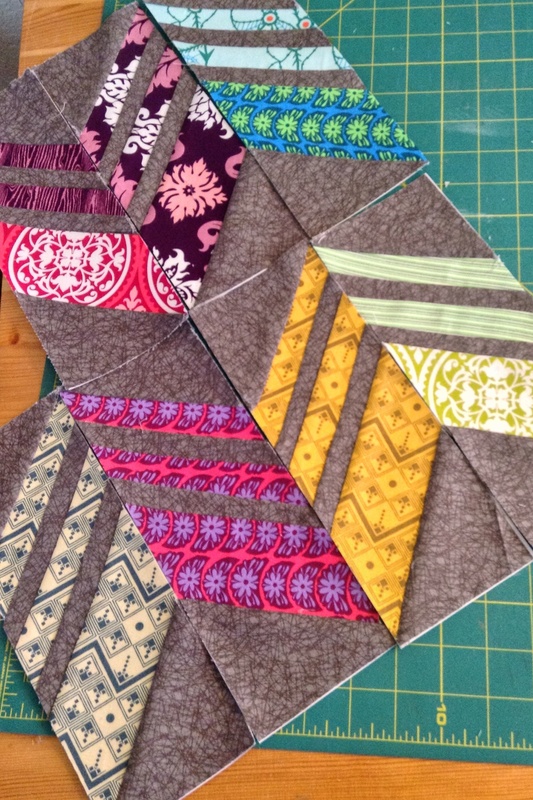 And I love seeing all of the other quilters’ fabric combinations. I am very happy I dove into this one. 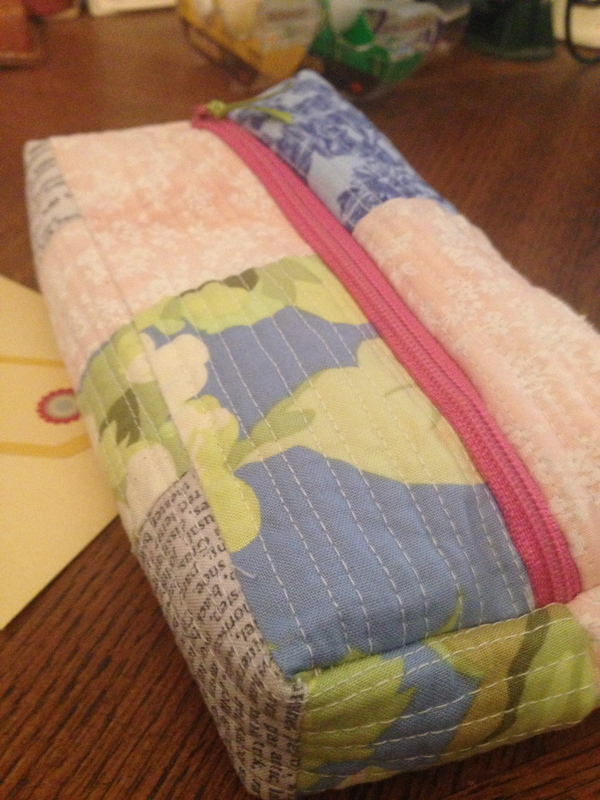 Sewing and kindness – can’t beat that. 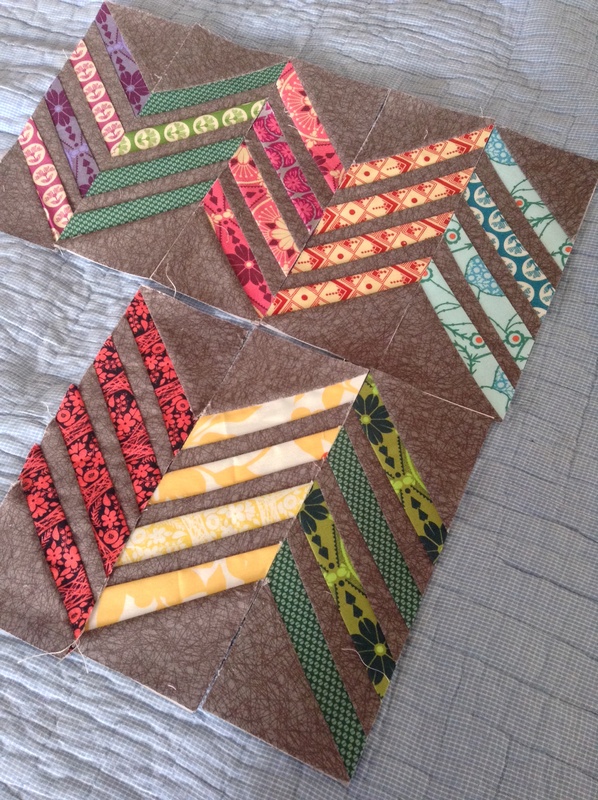 My blocks E and F, mostly with fabrics from Joel Dewberry’s and Anna Maria Horner’s true colors lines. That pink medallion fabric at the upper left is my new favorite fabric. Done: Two Tops and a Back! My stack of unfinished projects is growing. Boo! So I took some time to finish some stuff up. 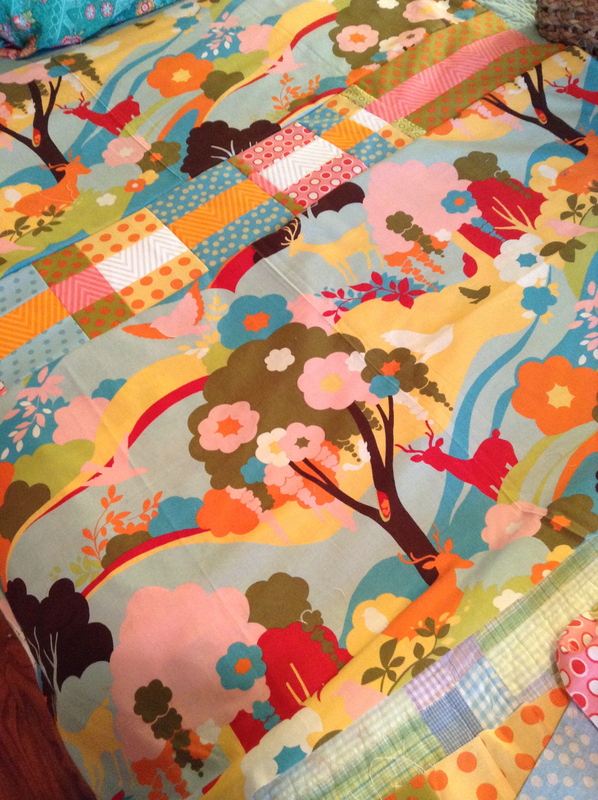 First up, the top that will be for Project Linus or maybe a friend’s baby… regardless, this fabric is gorgeous. 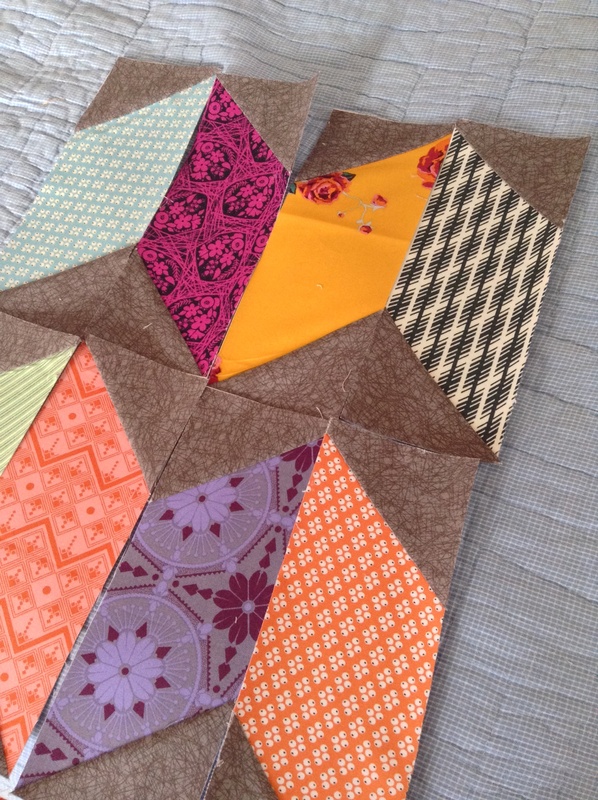 I finished all those little 2″ squares. Love. Next, the top of a Project Linus quilt with LOTS of polka dots. I had to unstitch a couple of fussy cut deers that I had originally put in the top. Ugh. Hassle. But it is so much cuter with the polka dots only. And the deers I cut made the fabric I had for the back to small. Ugh. Hassle. and DUMB! 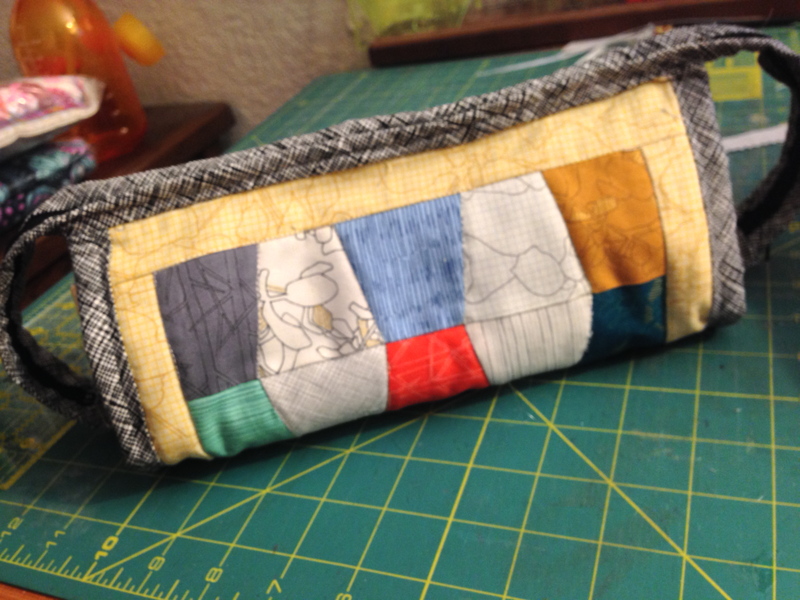 So I sewed a strip of scraps. I think it turned out ok. My gosh do I love this Oh, Deer fabric. So frickin’ cute. I now have a lot of quilting to do. A lot. Come on, Sunday! 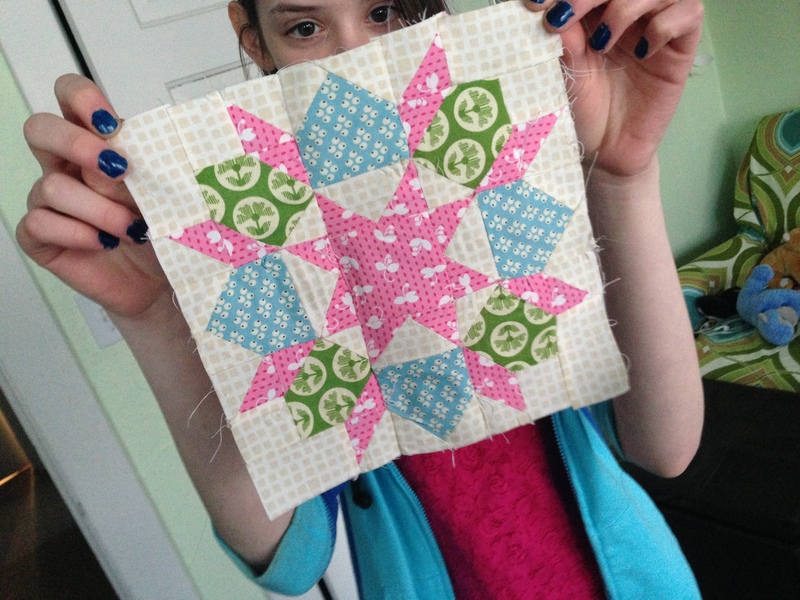 Linking up with Finish It Fridays @ Crazy Mom Quilts. Because getting these finished is a sort of finish-y thing. The good news is that I need to make at least three quilts for my new living room so that everybody can be cuddled up when it gets cold in our drafty old house. The bad news is that my living room has a color palette not reminiscent of Easter Bunny farts. We went with grey and bold colors… not a lot of precious greens and pinks. And so I have been stretching my palette (here and here). 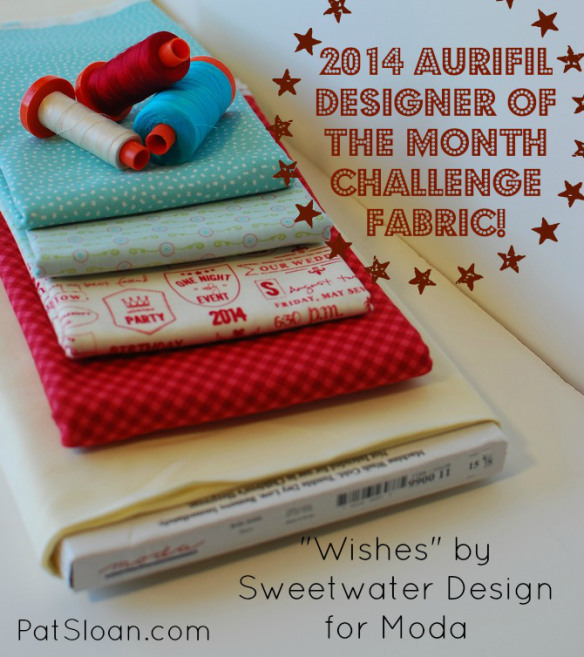 It has hard for me to get inspired to work on a quilt because I prefer, well, baby colors? But then the Feathers Quilt Along came along. 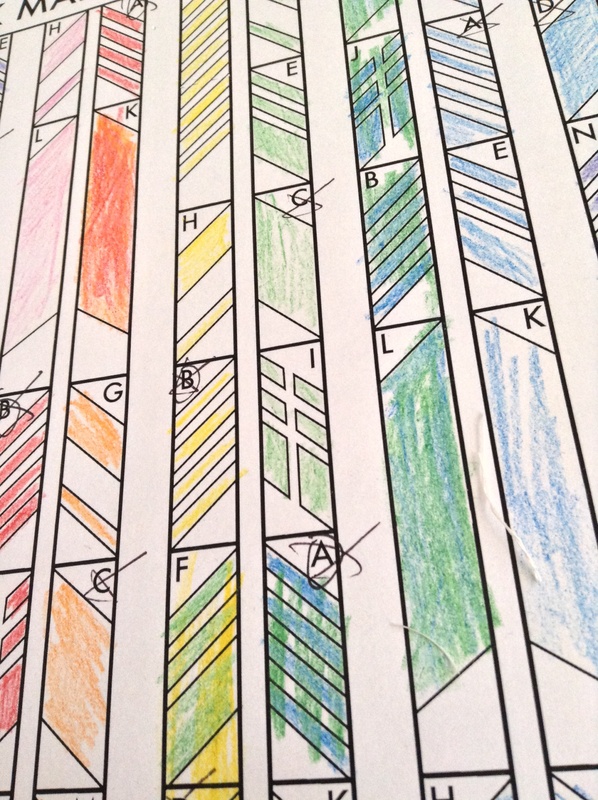 I LOVE this quilt (pattern/pictures here) – looks like Frank Lloyd Wright stained glass. So all week I have been catching up – and learning how to add my pictures to Instagram and Flikr feeds using tags – I am a bit behind. Next I need to find out what a “Linky Party” is. I got to play with colored pencils for my design. 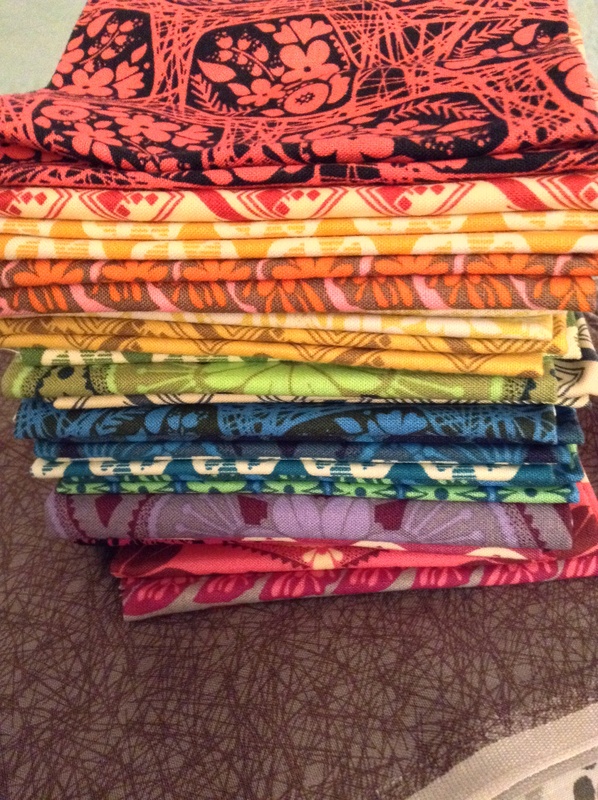 And then I got to wait patiently for the Anna Maria Horner true colors FQ bundle to arrive in the mail. I am using “Nest” by Mark Hordyszynski/Michael Miller for the background. 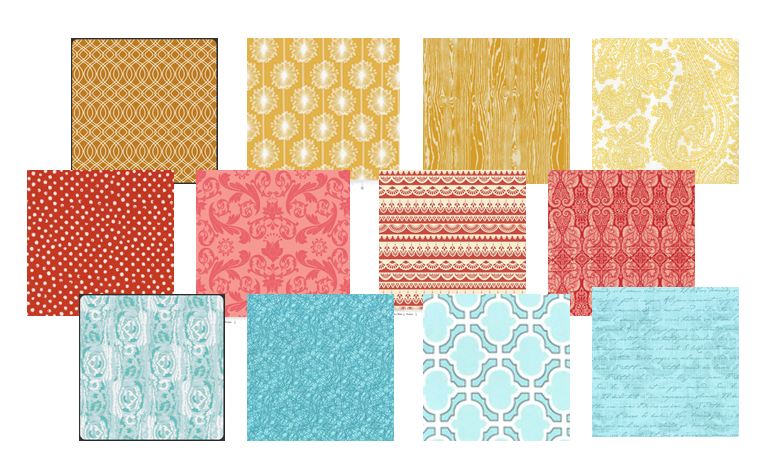 I ended up adding a few more fabrics from my stash to the color line up – mostly other Anna Maria Horner prints. And then blocks A & B. It took me a bit to get into the paper-piecing groove of things. It was slow going at first, but I do love how accurate the blocks turn out. Loverly. And then today I finished blocks C & D just moments ago. These went much more quickly. 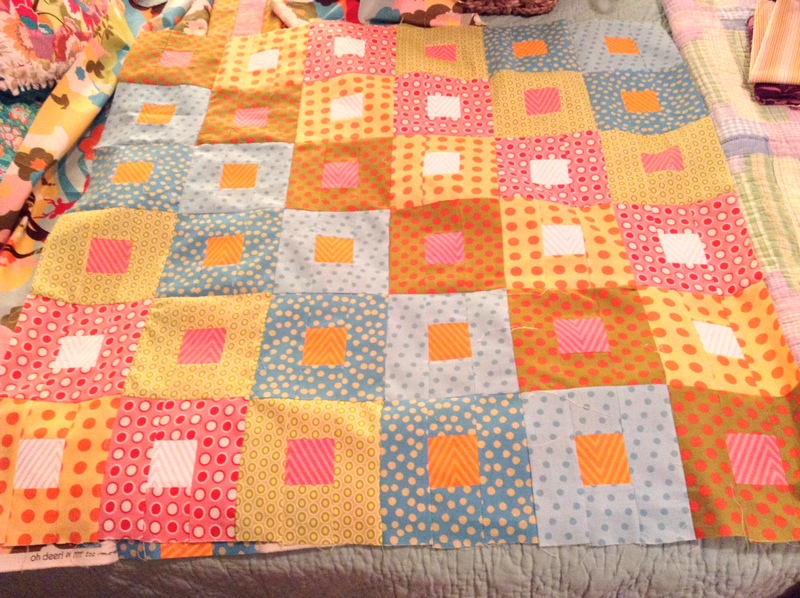 And I am going to get pretty braggy here… I got my blocks linked to #feathersQAL on Instragram. Like a computer genius, I am. 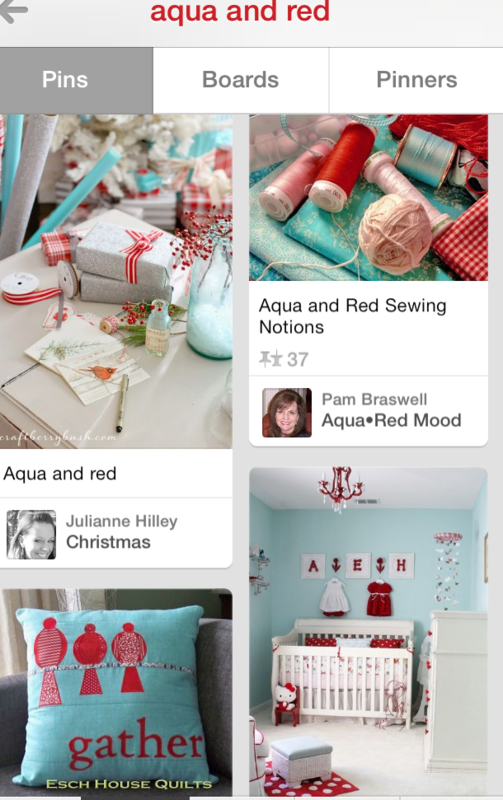 If you search for “aqua and red” on Pinterest, you definitely get an eyeful! I love the combination, but it seems it can move from perfectly sweet to tooth decay fairly quickly. 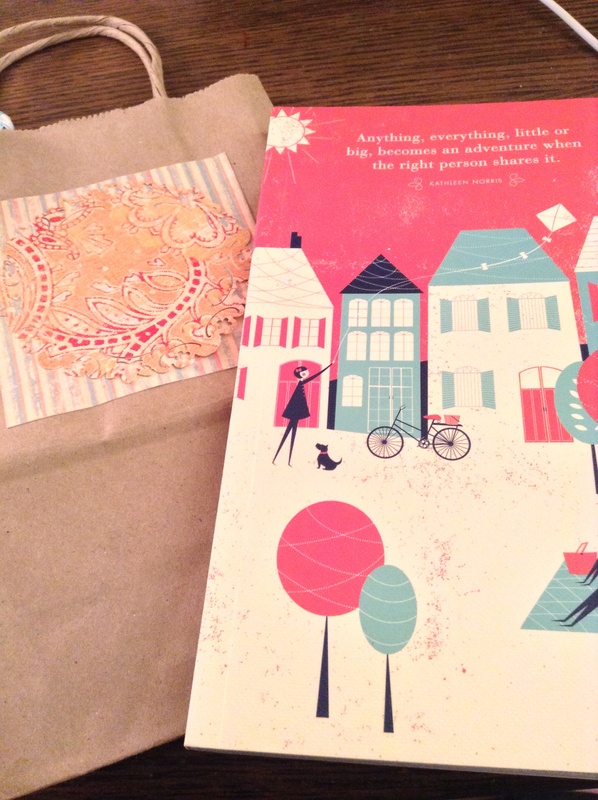 And then I received this lovely gift from a friend in a lovely bag. Beautiful use of red and aqua, and on the front of the bag, the gold grows up the color combination. It is just gorgeous. 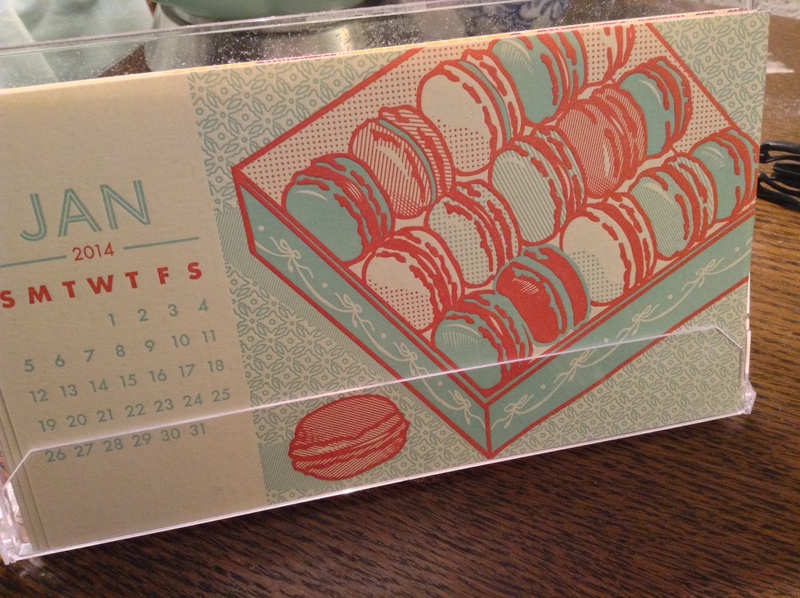 And thusly – Aqua, Gold, Red – my new color obsession. I love how the first block turned out. For the blue, I used “L’Amor” in teal that I picked up from JoAnn the other day – the rest are scraps. I put all the spools in the same direction, because “Bowties are cool”, and because I love how the prints form two diagonal squares. You will note that there is some pink. 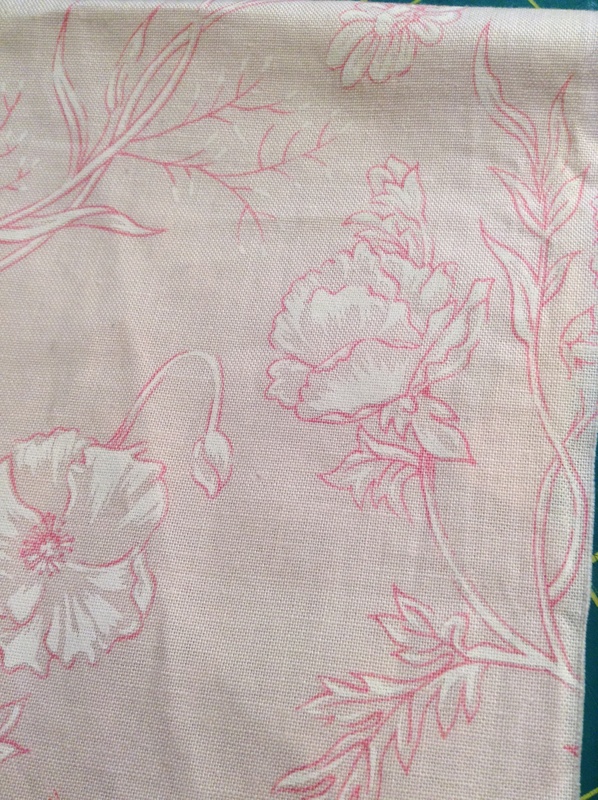 I cut into some precious scraps of one of my favorite pinks from years ago when I first started sewing. I have a fairly decent collection of perfect soft pinks that I treasure. So, I have no idea what I am going to do with this – matches nothing in my house. But I know I want a full-size quilt out of this palette. 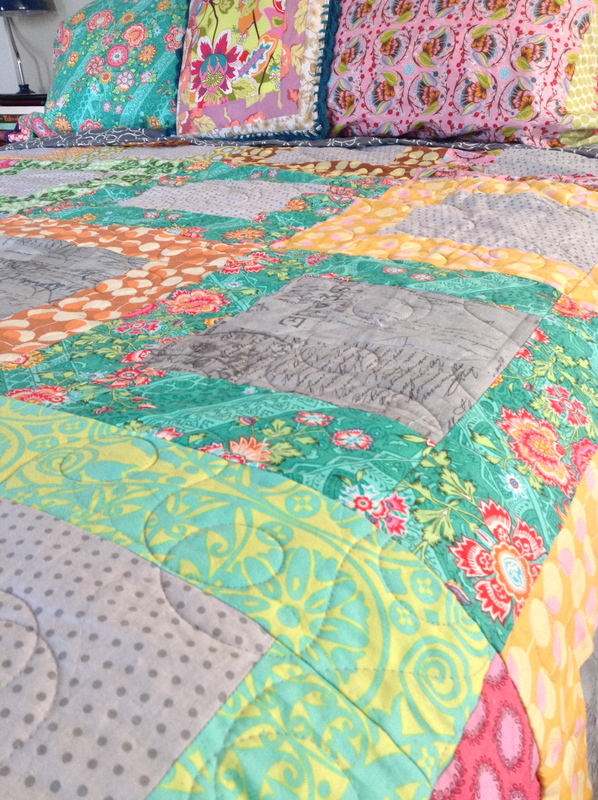 Maybe just start a pile of gorgeous quilts in my bedroom? We’ll see… it is a long road from this first block to that dilemma. But I am pretty sure this color crush will stay with me for the whole trip.